It’s official. I’ve become the crazy chicken lady. 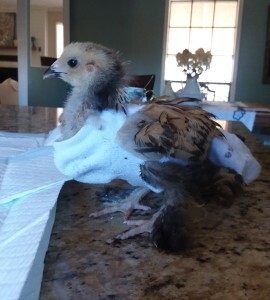 This morning I spent an hour trying to make a diaper for a chick. It’s very late in the season to have a hen want to hatch eggs and yet, I had two that decided they were going to be new mothers during the cold months. One hen succeeded and hatched three chicks. The other lost her eggs during a cold front and gave up. 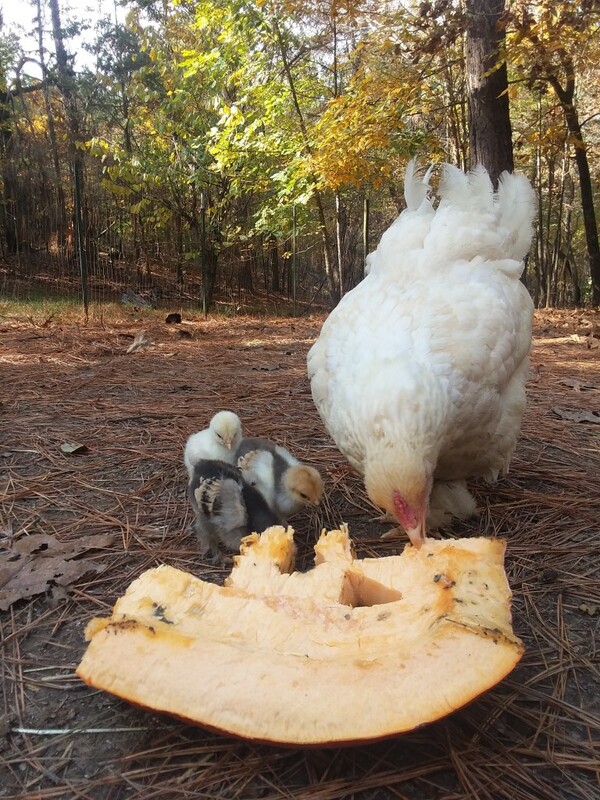 Things went well for the hen and her little ones until the temps dropped. She was late to molting due to sitting on eggs and started losing her feathers. 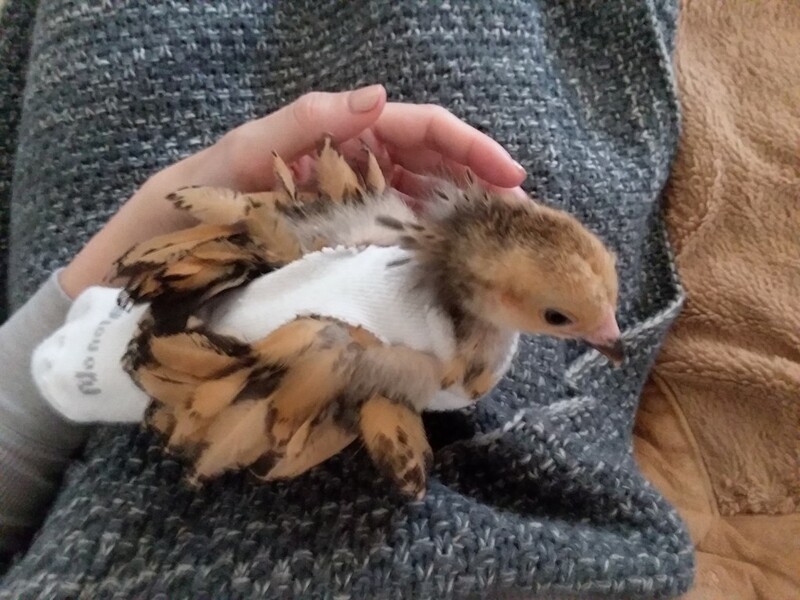 It was hard for her to keep up with the babies and keep them warm with so much feather loss. A couple weeks into it she lost one chick through a freak accident, two nights later she lost a second one who froze. I couldn’t trust her with the last baby. I found the baby on the ground, alive but not moving. I couldn’t tell if she was hurt or just really cold so I scooped her up and put her in my jacket. It took her a long time to perk up but once under a heat lamp she recovered and started chirping happily. Since then she’s been in my house under a lamp. She was content with this for a week or so. During warm days I let her back outside to be with her mom who took her back every time. Each night I brought the baby back inside where she would eat and sleep for the night. This worked well until a few days ago when the temps stayed low during the day. Not having daily outside excursions made the chick restless. She would fly out of her crate and come find me in the house. As cute as that is I couldn’t stand having to clean up after her and I don’t want her to poop on my white carpet. 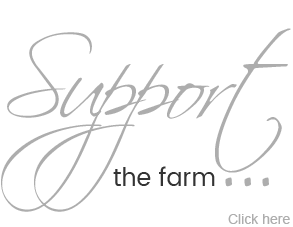 Yes, I know white carpet is a bad idea for a farm. This morning I decided I had to do something. She can’t be outside, not even in the barn, it’s too cold. And since I don’t have any way to contain her with her flying ability I decided it’s diaper time. So I did it. 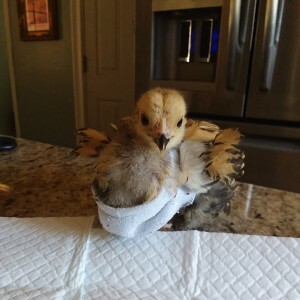 I made a chicken diaper. After several failed attempts, which I’ll spare you the details, I opted for an old sock. It’s a brilliant idea, really. It stops the poop machine and helps keep her warm on the drafty floor as she explores the house. AND it’s the cutest way to put a sock without a mate to use. Bonus! She’s a little small for my size 7 sock but it still worked well. You’ll have to adjust the size of the sock to fit the size of the bird. The opening of the sock is where her head is and the heel of the sock makes a natural pooch for her crop as she eats. All I did to make it was cut two holes in the top for her wings and two on the bottom (where the arch would be) for her legs. Notice the white pee pad she’s standing on in the image above. I had one on hand to cut into squares to fill the toe (diaper part) of the sock to help absorb any extra moisture so it didn’t come through the sock material. Chicks can poop a lot. If you don’t have a pee pad you can use paper towels or any other absorbent material. It worked like a charm. It took her a bit to get used to and she picks at it a little but I can deal with that. Now my little peeper can hang on the couch with me while I work and I don’t get crapped on.